A look back at the undoing of former secretary General of the United Nations Kurt Waldheim when he ran for leadership of Austria. Though narration and film and video from the campaign we watch as Waldheim's Nazi past came back to haunt him. I am very mixed about THE WALDHEIM WALTZ. While I went in very interested in the subject and while I was very attentive for a bout half the running time, my interest began to wane as I realized that the exclusive use of archival footage wasn't going to give me any grand new insight. 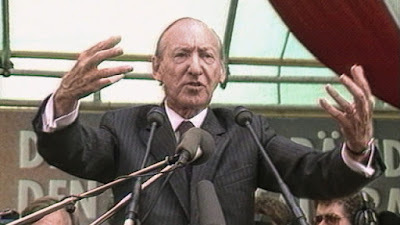 I remember following the story when it was transpiring so I saw some of the footage and heard a good number of the arguments Waldheim used to keep his head above water. For me there wasn't a great deal new here. On the other hand in light of recent political happenings in the US, particularly the confirmation of Brett Kavenaugh as member of the Supreme Court it becomes clear that our pasts will never stop haunting us and that our misdeeds will cost us. One can see the parallels in that the old Nazi said he wasn't there and it's not what you think in the denials by Kavenaugh in that he wasn't there and it wasn't what you think.For me the interest in the film returned as I saw the two stories echoed. Hopefully we will see the parallels play out to the end with the Supreme Court Justice meeting a similar ignoble end. Worth a look if you don't know what exactly happened or want to see why this story has relevance in todays world.